What Is Pex Plumbing System? The acronym PEX stands for “cross-linked polyethylene.” Typical polyethylene is the main ingredient in many plastic products, including packaging and shopping bags. The manufacturing of cross-linked polyethylene alters the material’s molecular structure, lending it elasticity and high temperature resistance. The acronym PEX stands for “cross-linked polyethylene” Typical polyethylene is the main ingredient in many plastic products, including packaging and shopping bags. The manufacturing of cross-linked polyethylene alters the material’s molecular structure, lending it elasticity and high temperature resistance. Formed into tubing, PEX can carry residential water supply, both hot and cold. Manufacturers physically or chemically link the molecules of standard polyethylene to create PEX. The link between molecules is permanent and transforms the polyethylene into a “thermo-set” plastic, a plastic that will not melt or reshape and exhibits higher resistance to chemicals than standard polyethylene. As a thermo-set plastic, PEX is highly flexible, resists punctures and notches and carries higher temperatures than standard polyethylene. For residential plumbing purposes, PEX pipe is available in flexible tube form. Whereas copper and PVC plumbing systems require messy, labor-intensive soldering and gluing, PEX plumbing pipe uses a slip-fitting and crimp system to connect lengths of tube. To install PEX, a plumber slides a PEX crimp connector over the tube, slips a fitting into the tube’s opening and crimps the connector over the fitting. 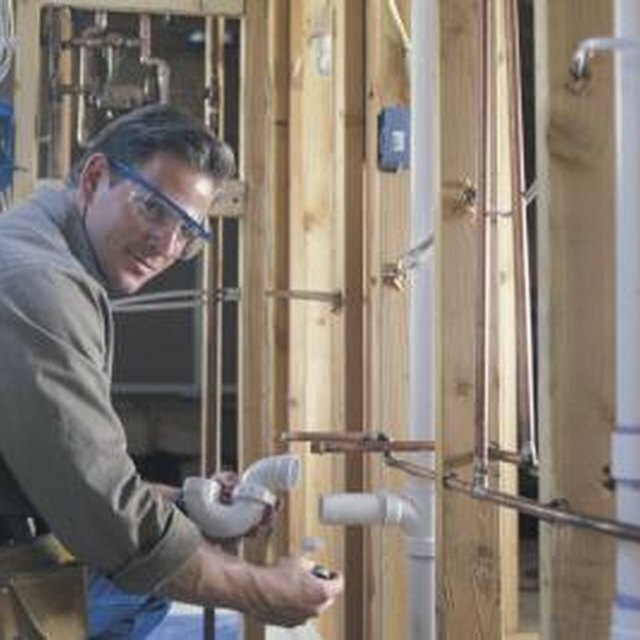 Installing PEX requires less skill and time than installing traditional copper and PVC plumbing systems. PEX meets the safety standards of several testing organizations, including the American National Standards Institute (ANSI). PEX plumbing systems meet ANSI standards for the transport of potable water. The thermo-set plastic that makes up the majority of a PEX plumbing system is an inert compound; PEX tubing is nontoxic and won’t contaminate water running through the system. Unlike PVC, which uses chemical solvents to join parts, and copper piping systems, which often use lead solder to join parts, a PEX plumbing system’s parts join without the use of chemicals. The unusual characteristics of PEX offer several advantages over traditional plumbing systems, including energy efficiency and durability. PEX has a greater R-value than alternative plumbing pipe materials. R-value is the measurement of resistance to thermal loss -- in other words, how quickly heat or cold transfers through a material. The high R-value of PEX means that hot water stuck inside the PEX tubing remains hotter for longer than it would with other piping materials. This characteristic reduces the workload of your water heater and saves you money on energy bills. Also, PEX exhibits greater durability than other plumbing piping. PEX resists two of the most common failures of alternative piping systems: corrosion and bursting due to low temperatures. What Is a Standard Classroom Lockset?